Product prices and availability are accurate as of 2019-04-23 19:52:55 UTC and are subject to change. Any price and availability information displayed on http://www.amazon.com/ at the time of purchase will apply to the purchase of this product. 1. 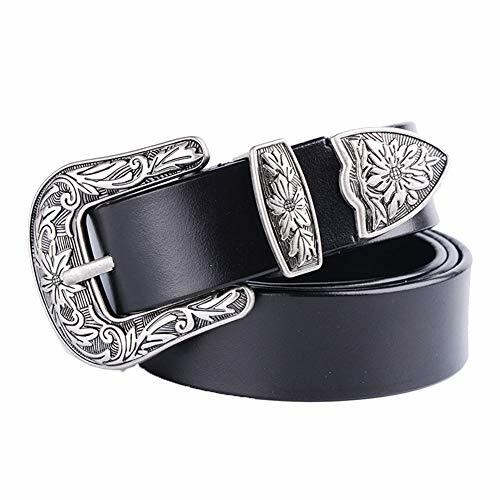 Superior in Quality: This belt made from genuine cowhide with a vintage metal buckle, which ensures the high quality of the belt. 2. 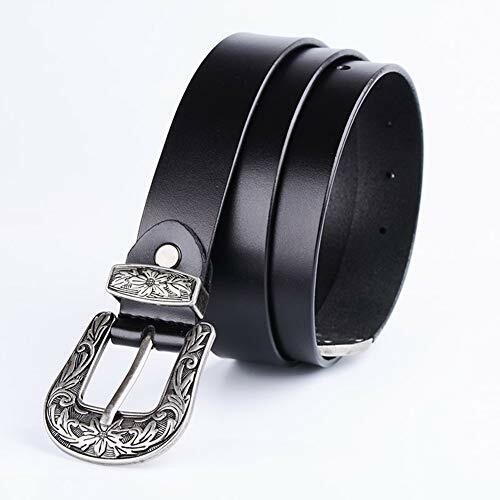 This elegant designed women belt is a good match with high-waist Jeans and crop tops, any casual pants or cowgirl style outfit, not only for holding up jeans and pants, but also make you looks unique and stylish. Great for everyday wear, a night out, club, or a country music concert. 85cm/33.4", suitable for pants size 24"-28"
95cm/37.4", suitable for pants size 29"-32"
105cm/41.3", suitable for pants size 33"-36"
115cm/45.3", suitable for pants size 37"-40"
3. 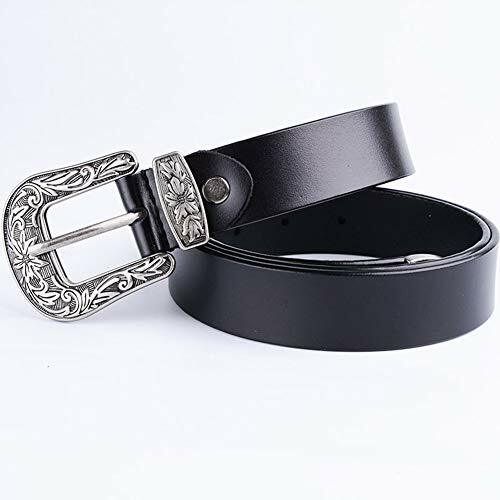 Buckle length: 5.5cm/2.17"; Buckle width: 6cm/2.36". 1. If you're unsure of which size to buy, we would always suggest ordering a slightly larger one, rather than one that might just fit. As you can always cut the belt, but you can't extend the length of the belt. 2. DIY cut belt steps: Firstly, loosen the screw on the belt; Secondly, measure your waist size then cut to desired length; Thirdly, punch new hole by overlap the cut part on the belt; Lastly, make screw on, re-install buckle to belt. 1. We provide 100% satisfaction and 360 days warranty on our products. 1. 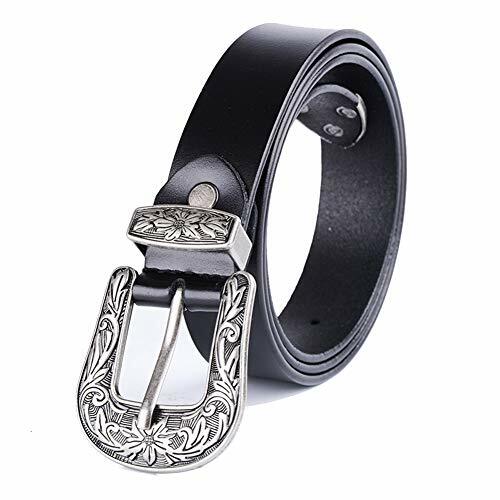 MATERIAL: Genuine Cowhide, The buckle is made of Zinc Alloy, shiny and durable, the Belt is Going to Serve you for a long time because of its high quality and leather construction. Low price for new Belts, will increase price in 10 days. 2. SUITABLE FOR MOST FASHION LADIES: Width:28mm(1.1inch), Suitable for Waist From 24" to 40", Buckle length and width: 2.36" * 2.16". To Get More Accurate Size, Belts are all tried on by our male/female staffs, you can feel free to buy. Please Measure your Waist before placing order. 3. CAN BE TRIMMED: The buckle is removable, this women leather belt comes with a hole punch, if it is longer for you,you can trim to fit your size. No matter how thin you are, you can have your perfect suitable size. It is closed in a Gift Box, Will be a wonderful gift for lover, friends or family as birthday gift or anniversary present. 4. Perfect Accessory for All Occasions: It is an absolutely must have for girls or women with a passion for fashion style! 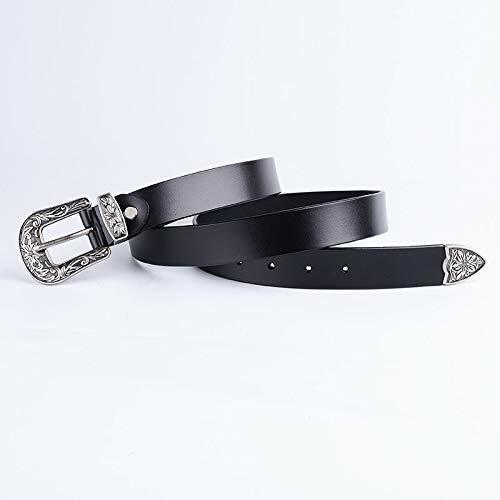 This elegant designed women belt is a good match with high-waist Jeans and crop tops, any casual pants or cowgirl style outfit, not only for holding up jeans and pants, but also make you looks unique and stylish. Great for everyday wear, a night out, club, or a country music concert. 5. WE GUARANTEE YOUR SATISFACTION: We want our clients to be happy, so just in case you feel disappointed with your purchase, We guarantee the quality of our products, 100% satisfaction guaranteed, 45 days free exchange and returns plus 360 days warranty.